Yes, I realize the issues with using a social media site like Instagram as a personal guidepost. After all, social media is about likes, comments, expanding your reach, and going viral, right? Stick with me for a bit and let me explain how I’m proposing to use Instagram as a useful tool for our personal journeys. What about when we’re not on trail? How can we keep on our chosen path? Whether it’s training for a bike race, wanting to get outside more with our kids, or trying to see more of the world, we need our own personal guideposts to keep us on that path. This is where Instagram comes into the picture (no pun intended). Ignore all of the social aspects for a minute and think about what Instagram allows you to do. It is simply a way for you to post pictures and catalog your experiences. Additionally, it can be accessed from anywhere at anytime. This allows you to visualize your personal story through your own images. Of course, you’re only looking at the images you have posted, but if you deemed it a shareable picture, it must be something important to your story, right? Look at your last 5-10 Instagram posts. Now, look at the last 20 pics, skipping every other one. Finally, look at every 4th picture out of the last 40. 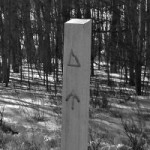 These are our guideposts even if they are guiding us onto the wrong trail. Seeing the bigger picture and the themes can be eye opening. When hiking or biking a new trail, we don’t just put our head down and keep going. Instead we consult our maps, we look at the guideposts, and we plan ahead. Why do we tend to ignore these navigational techniques on our journey through life? In a busy world full of distractions, it’s easy to get off track. Using Instagram as a personal story tool rather than purely for social media is a way to make sure our story is following the guideposts we want. Since it’s always accessible from anywhere, we can check our personal guideposts at any time. It doesn’t require going home to review notes or looking up what we wrote as our guide months ago. As the business saying goes, “that which gets measured, gets done”. Use Instagram to make the story visible and to verify we are following the correct guideposts. Don’t let it become a Yogi Berra situation where you get to a fork in the road…and take it. Be sure it’s the right fork based on personal goals and dreams.